Heather McDermott Jewellery specialises in contemporary jewellery made in Stainless steel and silver. Designed and hand made in Scotland. Free postage to the UK. 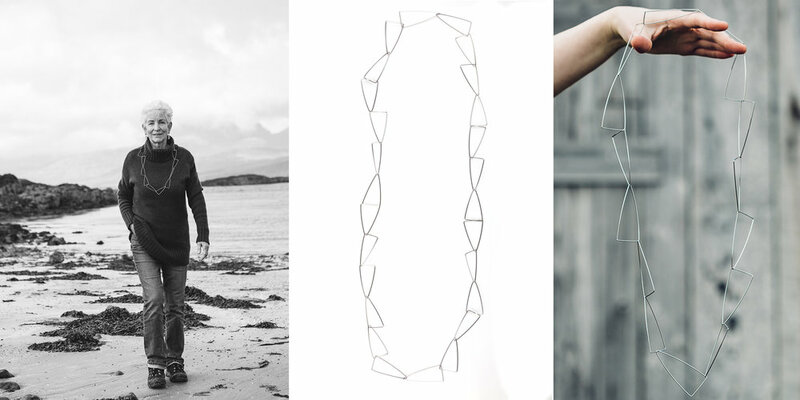 Heather McDermott Jewellery specialises in contemporary jewellery made using stainless steel and precious metal. Each piece is made in her studio in Glasgow, Scotland. She takes her inspiration from her island home, the Isle of Skye. Fisherman's nets, stacked creels and weathered buoys scatter the ever-changing shoreline and it is here Heather is inspired to create her Buoy earrings, Stacking Creel Bangles and Short Fankle necklaces. Sign up to Heather's newsletter to get 10% off your first online order and find out her latest news throughout the year. Thank you for signing up! You won't be bombarded with emails, Heather sends out newsletters monthly, jammed packed full of exciting information so look out! Also if you haven't heard from me check your spam folder because it may have ended up in there!